Today marks the 20th anniversary since the death of Geoff Hamilton. 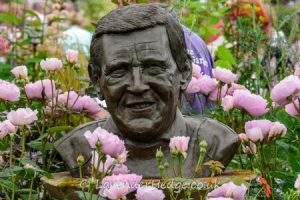 Geoff was the presenter of BBC Gardener’s World in the 1980s and 90s and, in my opinion, was the best ever presenter of the programme. I loved his friendly, down-to-earth approach to gardening. He offered gardeners practical advice and encouragement, showed us his failures as well as his successes. He was a great innovator and would upcycle and recycle things before this was a fashionable thing to do. He cared deeply for the soil and wildlife, and championed environmentally friendly methods of gardening. He was, quite simply, my gardening hero. I loved his cottage-garden style of gardening and he was my inspiration for my little bit of Paradise on earth.